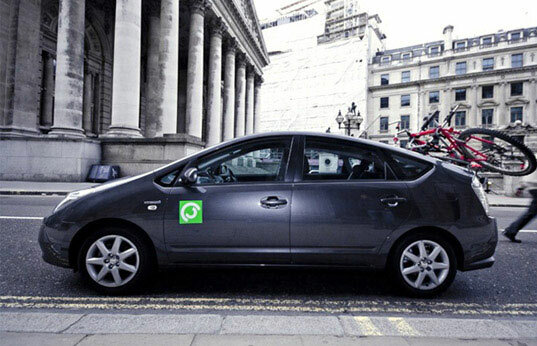 Founded in June 2007 by Nicko Williamson, Climatecars is London’s eco-alternative cab service. Although the popularity of cycling around the UK capital is significantly rising, the Climatecars service is sure to help improve awareness to many Londoners who still need to use taxi services. With an ambition to combine ecology, economy and innovation, the Prius hybrid car service cuts the carbon footprint of iconic black cab rides from 243g/km to 104g/km. Branded by London based design agency Bibliothèque, the Climatecars fleet “uses a combination of the latest hybrid engine technology and carbon offsetting, resulting in a carbon neutral car service where every customer is treated as a VIP.” The company’s use of sleek black Priuses cuts their fleet’s carbon emissions by more than half, and they they use The Carbon Neutral Company to offset the remaining emissions. We’re also happy to hear that all cars come complete with bicycle racks free of charge, providing an added bit of security to urban cyclists who get caught in the rain or stuck with a flat. Very true about the above comment. If your going to advertise it more, then maybe you should try it on the cars themselves. Personally I think if the cars have just a small box with the logo, no web address, phone number or slogan well, then there's the first mistake. I might be wrong though, it could be on the rear of the car, but that still limits the observer to knowing what the logo is for. The Prius doesn't exactly turn heads especially with the hybrid range by Lexus. I think it's a great idea. Now that I know about them and if I had to go by taxi, I would choose their service over green tomato provided booking is easy, and cars are available. Founded in June 2007 by Nicko Williamson, Climatecars is London's eco-alternative cab service. Although the popularity of cycling around the UK capital is significantly rising, the Climatecars service is sure to help improve awareness to many Londoners who still need to use taxi services. With an ambition to combine ecology, economy and innovation, the Prius hybrid car service cuts the carbon footprint of iconic black cab rides from 243g/km to 104g/km.